This book came about as a result of a series of conversations at the Worshipful Company of Management Consultants, a livery company of the City of London. The seven authors are seasoned management consultants with a collective experience of over 200 years of professional practice. The book grew from our desire to capture our experience of insightful questioning and to package it in a way that would be accessible and useful for practising managers. Like the practice of management consultancy itself, we have been on a learning journey. Over time, our focus has shifted from solving problems using our expert knowledge, to creating shareable methodologies, to mentoring our clients to help them to develop their own solutions. We now prefer the mentoring approach – it takes longer, but is also much more effective in leaving our clients better off after we have left, as they learn to help themselves. Each of these approaches to consultancy has its own strengths and weaknesses and has its own place, but ultimately each of them relies on the ability to ask the right questions. Be warned, this book does not have any answers to offer. The reality is that you, with all your own knowledge and experience, have them already, but to unlock them, you need to ask yourself, or your team, the right questions. This unique book will help you to do just that. Problems are seldom what they seem. To find better ideas for action, you need to understand the problem, go behind the surface level, find deeper causes, and think better. You need better questions. How might the questions help you look at your problems with fresh eyes, as an outsider? How might the questions help you to dig deeper? How might you see things differently? Successful and experienced leaders know that, however a situation presents itself, there are likely to be hidden problems behind it. What better way to uncover these hidden depths than by asking questions that take you beyond the obvious? This book isn’t intended to be the advice a consultant, lawyer or mentor might offer at a moment of crisis, nor is it intended to be directive. Indeed, if you are reaching for this book in an urgent crisis, there are probably one or two other questions you might ask yourself! 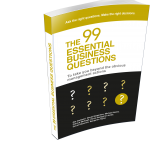 This book does not contain the obvious questions and solutions you need in any situation. Our intention is to suggest some incisive questions that will lead you to find your own better answers to situations you face in business. The questions are generative so as to encourage divergent and creative critical thinking. Though there can never be one right answer, there are right questions, which will help you find good answers. It was a delight to read a management book which reflects the true complexity of organisational leadership. This book challenges directors to systematically test their knowledge of how well an organisation is working and their contribution to the organisation by working through 99 questions. The process helps to force innovative thinking into the organisational culture. Every non-executive director should buy a copy.